Hong Kong’s Doo Hoi Kem stood alone as play in the top half of the draw in the Women’s Singles event at the Seamaster 2017 ITTF World Tour Platinum, Hybiome Austrian Open in Linz came to a close; the other three names were all from China. In the lower half, as play concluded on the evening of Friday 23rd September; the distinction of being the sole survivor belonged to Japan’s Hina Hayata. A battle of the generations most certainly; Hina Hayata overcame an opponent, who 17 years before she was born had been World Championships gold medallist. In Tokyo in 1983, she was a member of the successful Chinese Women’s Team and winner of the Mixed Doubles title in partnership with Guo Yuehua. Success for Hina Hayata but in the remaining second round Women’s Singles matches it was success for China. 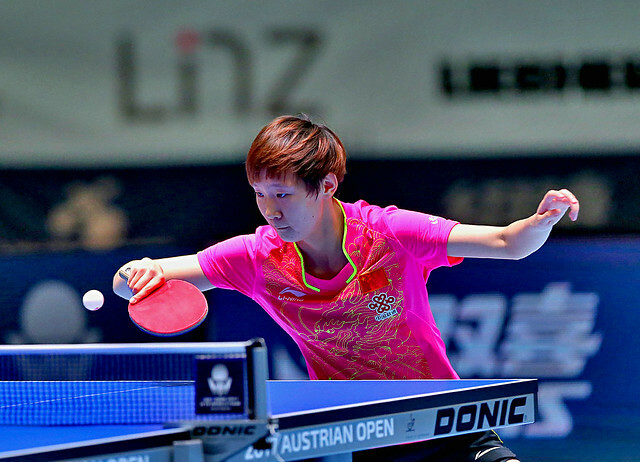 Zhang Rui, Gu Ruochen and Gu Yuting all recorded impressive wins. They emerged victorious in contests that were comprised entirely of players who had been required to compete in the qualification tournament. The situation somewhat different to the top half of the draw, where like Doo Hoi Kem, the Chinese trio of Chen Meng, Wang Manyu and Sun Yingsha were all seeded players. One half all seeded players, the other all qualifiers; undoubtedly it is an unusual situation for a quarter-final round at a major international tournament. Zhang Rui emerged successful in the all Chinese duel beating Wang Yidi (3-11, 11-7, 13-11, 4-11, 11-9, 11-7); Guo Ruochen accounted for Portugal’s Fu Yu (11-5, 11-4, 11-3, 11-6), whilst Gu Yuting ended the hopes of Japan’s Yui Hamamoto (11-6, 11-5, 11-8, 13-12). At the quarter-final stage Zhang Rui meets Guo Ruochen, Hina Hayata opposes Gu Yuting. Matches in the round of the last eight and the semi-finals of the Women’s Singles event will be played on Saturday 23rd September.